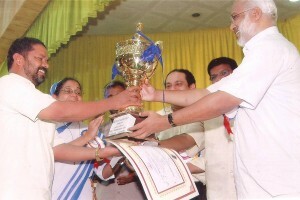 MIHS PTA awarded the best PTA award in aided schools of Kerala State for the academic year 2008-2009. The award comprises Rs.10000 in cash and an Ever Rolling Trophy. The award was presented by Mr. M A Baby, the honourable Minister for Education and Culture, Kerala on the occasion of Teacher’s Day. School Head Mistress Sr. Lissy Ignasius and PTA President Mr. Rajendran recieved the award from the minister in the presence of Mr. Mohammed Haneesh IAS , Director of public education Kerala.